The gift that arrived earlier this week was quite literally a brown paper package wrapped up in string. (The string in question was black and white, of course.) 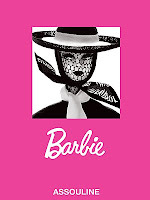 Inside it was a wonderful surprise from generous friends: the Barbie limited-edition book published in honor of Barbie's 50th anniversary last year by Assouline. The inscription reads:"To the only real-life 'Barbie' we know!" Given my friends' range of glamorous, successful acquaintances, that's quite a compliment. So thank you, friends, on all counts. I've previously discussed what Barbie and I have in common. Now, she has a big, beautiful book about herself, and I have the pleasure of looking at it. The big, beautiful book about me? I'm just going to have to write it myself. And, as the great sage Hillel once said, "If not now, when?"